Natural and Artificial Flavors, Citric Acid, Malic Acid, Sucralose, Acesulfame-K, FD&C Yellow No. 5, and FD&C Blue No. 1. Natural and artiﬁcial ﬂavors, citric acid, malic acid, sucralose, acesulfame-K, and FD&C Blue No.1. Natural and Artificial Flavors, Citric Acid, Malic Acid, Sucralose, Acesulfame-K, FD&C Yellow No. 5, and FD&C Red No. 40. Maltodextrin, Natural and Artificial Flavors, Citric Acid, Sucralose, Malic Acid, Acesulfame-K, Silica, and FD&C Blue No. 1. Use on Training Days Only. 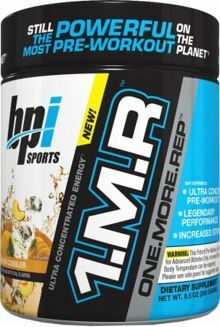 Take one (1) serving (1/2 scoop) approximately 15-30 minutes prior to training, blended into 6-8 ounces of cold water or beverage, or as suggested by a qualified healthcare practitioner. Important note(s): Do not exceed one (1) serving (1/2 scoop) per training day. Avoid eating food or drinking a protein shake within an hour after consuming 1MR. To avoid sleeplessness, do not take within four (4) hours of bedtime. Not intended for use by persons under age 18 or those sensitive to caffeine. Do not exceed recommended dose. Do not take for more than eight (8) consecutive weeks. Get the consent of a licensed physician before using this product, especially if you are taking medication, have a medical condition, you are pregnant, nursing or thinking about becoming pregnant. Stronger and More Concentrated than Ever! Small Single Scoop in a 4-6oz of water.